Two photos of an overhead feeder to a garage. If the light bulb is wired in series on the hot conductor, does it qualify as a service disconnect? (ignoring mounting height of course). You're showing us one of the standard practices here in the Mountain State. 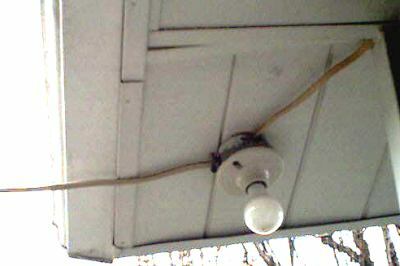 You're going to have to quit putting up these pictures, folks are going to think that there is no such thing as good electrical work in WV. If I get a chance, I'll shoot a picture of the tennis courts (owned by the city) in Bridgeport, WV. 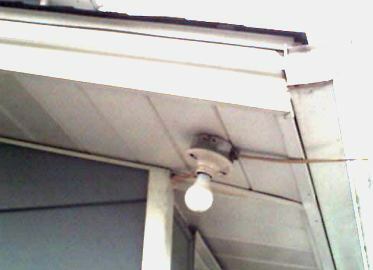 There is a piece of cable between two light standards that just might be Type UF, which wouldn't make it right since it isn't listed as an aerial cable. Somehow this got past the AHJ.